The CHOGM is over and the caravan has moved on but the controversy it raised cannot be brushed aside. Seldom has an issue concerning India’s external relations raised such hue and cry as the decision it needed to take regarding participation at the level of the prime minister in the recent Commonwealth Heads of Government Meeting [CHOGM] in Colombo. This may look odd because the CHOGM is not an international event of earth-shaking consequence and India’s prime minister, in fact, skipped the event on five such occasions out of ten in the past decades. So what was the brouhaha about? 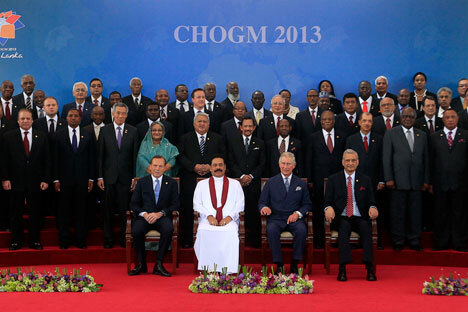 What has India lost and gained by Manmohan Singh not attending CHOGM? It all boils down to two arguments – the CHOGM venue is Colombo and India’s relations with Sri Lanka are highly strategic and, needless to say, any perceived slight by New Delhi would have adverse consequences in the downstream on the bilateral ties. Second, woven into the above is the making of foreign policy in India’s federal system – whether the strong opposition by one Indian state Tamil Nadu to India’s attendance of the CHOGM should weigh so heavily as it apparently did in New Delhi, which finally struck a compromise by deciding that prime minister wouldn’t travel to Colombo but India would be represented at the level of the external affairs minister. The CHOGM is over and the caravan has moved on but the controversy it raised cannot be brushed aside. Curiously, the controversy is to be entirely attributed to the so-called strategic community in New Delhi and its main thrust was that the political class in India at the state level lacks the acumen to discern what is in India’s “national interest” – that is to say, the national perspective is lacking in the stance taken by Tamil Nadu. It is safe to surmise that the strategic pundits, while making this criticism, enjoyed tacit encouragement from the foreign policy establishment in New Delhi. The core issue that crept up time and again was the expanding presence of China in Sri Lanka and the need for India to firmly counter it. That is to say, Sri Lanka should remain within India’s “sphere of influence” and New Delhi should therefore be proactive in its diplomacy. Many factors come into play here. The fact of the matter is that China has raised its profile in Sri Lanka in the past decade. But then, China-Sri Lanka ties have been very close traditionally. During the 1962 India-China war, Colombo took a neutral stance and even aspired to mediate. In the 1971 India-Pakistan war, Colombo allowed Pakistani aircraft to refuel in Sri Lanka en route to the then East Pakistan. Colombo has always factored in that diversified external relations help it to withstand pressures from India, which is its only neighbor. Often Colombo annoyed New Delhi by making it a point to carouse with countries with which the latter had problems. A glaring instance was the annoyance felt in New Delhi in the early 1980s that the then Sri Lankan president J. R. Jayewardene had “pro-American” leanings. New Delhi estimated that his probable decision to allow the Voice of America to have a relay station in Puttalam on the west coast of the island had “anti-Indian” connotations. Again, New Delhi watched with disquiet in the early 1980s the persistent reports that Jayewardene government sought the help of Israeli security experts for the “capacity building” of the Sri Lankan armed forces in countering the insurgency by the Tamil separatists. Clearly, those were times when the United States was regarded in New Delhi with great suspicion. The short point is, forever will Colombo seek out friendships that help it balance the overbearing presence of India. Colombo sizes up that Beijing is manifestly keen in having the closest ties with Sri Lanka, whose strategic location on the vital sea lanes connecting the Persian Gulf with the Strait of Malacca, affects China’s vital interests. Beijing will be willing to go the extra mile to foster ties with Colombo and is unlikely to be discouraged by thoughts of causing flutters in New Delhi. Having said that, Beijing has also been careful – so far at least – not to tread on India’s legitimate interests in Sri Lanka. Nor has Beijing been egging Colombo to adopt a path of strategic defiance of New Delhi. Ironically, the bulk of the big money it has put on the table in Colombo (to the tune of around $1.5 billion) has been in the form of loans at commercial rate – that is as export credits for Chinese companies to pick up lucrative infrastructure projects in Sri Lanka. It needs to be noted that Colombo too has never deliberately sought out a policy of strategic defiance of India. On the contrary, its priority has always been to constructively engage New Delhi so as to rein in the latter’s propensity to be prescriptive on the Sri Lankan Tamil problem. From Colombo’s perspective, any solution to the Tamil problem needs to be a Sri Lankan solution, which is to say, it should also be acceptable to the majority Sinhala community. Now, there are all sorts of atavistic fears embedded deep within the Sinhala mind that Sri Lanka being the last citadel of Buddhism in South Asia has to be constantly on guard to avoid the peril of virtual decimation that the religion (described as the “finest flower” of the Indian civilization by Jawaharlal Nehru) met with in the Indian subcontinent centuries ago at the hands of Hindu revivalists. Certainly, New Delhi has not helped matters in the contemporary times, either, by blowing hot and cold over the Tamil problem and by its failure to consistently uphold a principled policy. Clearly, New Delhi needs to prepare itself for a paradigm shift. Colombo has decisively defeated the Tamil separatist Liberation Tigers of Tamil Eelam after a three decade-old bloody war and the new-found self-confidence is propelling it to revert to its independent foreign policies. Meanwhile, the regional security situation has also phenomenally changed in its favor and China’s rise as a global power has a multiplier effect expanding Colombo’s options to ward off India’s pressures. Colombo feels comfortable with China’s friendship which comes with no strings attached to the Tamil problem. Suffice to say, the multipolar setting in global and regional politics helps countries like Sri Lanka to press ahead with their national agenda. It’s a losing battle to shore “spheres of influence”. New Delhi is slow to absorb the paradigm shift in the India-Sri Lanka relations. After having helped Sri Lanka militarily to brutally destroy the LTTE threat in 2009 Delhi should know that it has created space for the Sri Lankan political elites to insist more assertively than ever on tackling the country’s national question exclusively on its terms and its timeline. The mood in Colombo is plainly bullish and the Indian pundits who fancy Sri Lanka as falling within its “sphere of influence” are whistling in the dark.